I am from the midwest and generally the fish we get around here, we done caught’em ourselves! Large Mouth Bass, Catfish, Crappie, etc., etc. And believe me, I’ve got some pictures of me (and my family) with their biggest catch on my phone. Fishing is just one of those things that create some of the most vivid and fun memories of the good ole days of sunrise fishing with my family… Fishing is quite an animalistic experience of man vs. fish and it’s a battle of the wits to see who survives. Ok, maybe a bit dramatic but outsmarting a big one will forever give you a bit of pride that you’ll never forget. Nowadays, I don’t get out to go fishing, but Whole Foods does bring in a few nice ones (and puts them on sale!) every now and then. This week we found an interesting looking Red Snapper and decided to give it a go in the Sous Vide. I adapted the recipe from a few basics I found online. Once you get the basics for a whole fish in the Sous Vide (temp 130°F & time 60 mins) you can add whatever spices you like! I took this Red Snapper a bit more down the Asian inspired route and it turned out simply delicious. We were totally impressed by how flavorful and moist the meat was, while maintaining a nice flakiness. Roll of Bags for Food Saver – These have worked great for me and fit a fish! 2. Rinse the fish and make sure there are no guts in the body cavity. This can make the surrounding meat ultra bitter and unpleasant. 3. Create your seasoning blend, add ginger, garlic powder, thyme, sesame oil and olive oil to bowl and combine. 4. Rub seasoning mixture on fish and add some to the body cavity. 5. Create a food saver bag that is plenty long enough for your fish plus about 5 inches. This will give you enough bag to attach to side of sous vide container. 7. Put fish into sous vide water and set timer for 1 hour. 8. 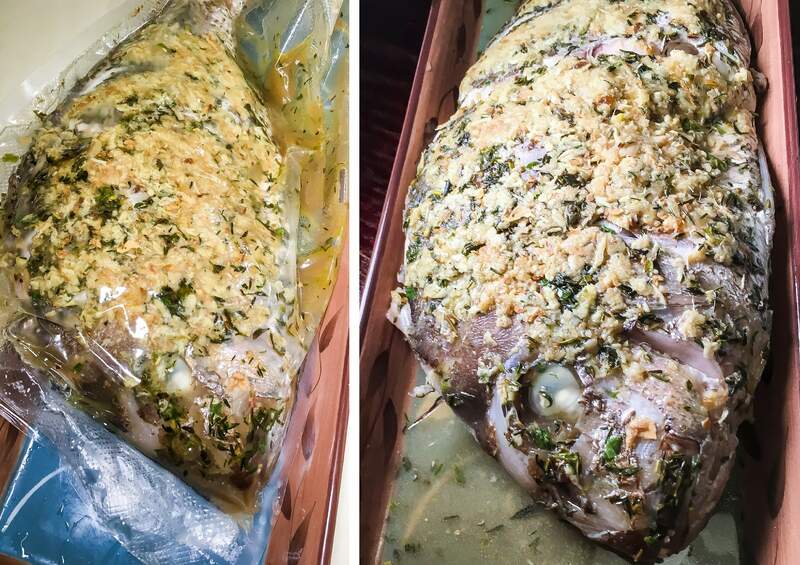 After 1 hour, remove the bagged fish from the sous vide bucket and transfer to serving dish. 9. Take a few pictures for Instagram and… Let’s Eat! Rinse the fish and make sure there are no guts in the body cavity. This can make the surrounding meat ultra bitter and unpleasant. Create your seasoning blend, add ginger, garlic powder, thyme, sesame oil and olive oil to bowl and combine. Rub seasoning mixture on fish and add some to the body cavity. Create a food saver bag that is plenty long enough for your fish plus about 5 inches. This will give you enough bag to attach to side of sous vide container. Put fish into sous vide water and set timer for 1 hour. 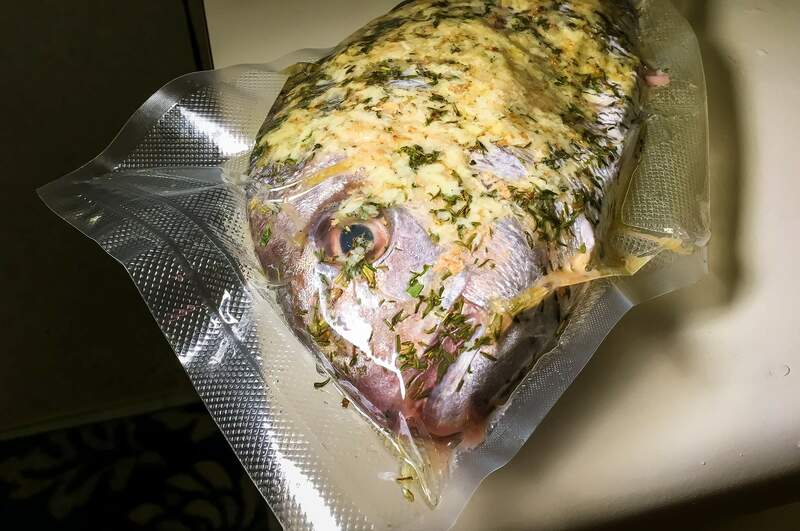 After 1 hour, remove the bagged fish from the sous vide bucket and transfer to serving dish. Take a few pictures for Instagram and... Let's Eat!